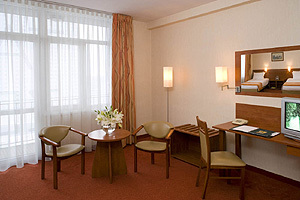 The hotel offers 191 comfortably furnished rooms, including 110 Standard Rooms, 44 Superior Twin Rooms, 8 Superior King Rooms , 18 Executive Rooms, 9 Junior Suite, 2 Suite type. 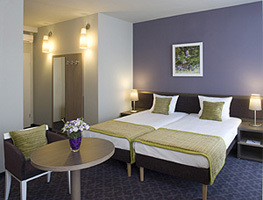 Non-smoking rooms and accommodation for disabled people are available, as well. Small pets are welcome. Metro Jazz Bar&Bistro - the casual bistro, which combines a tasty food, great atmosphere and reasonable prices. This is the best place to take your family, friends and business partners for a drink, food, sports and fun. Metro Jazz Bar&Bistro offers delicious menus and exceptional evenings with live music (jazz standards, piano and vocal). Sports enthusiasts can take part in all the biggest sports events and feel the atmosphere of football pitch, see the rivalry of the best tennis players, join the Formula 1 drivers in their dangerous speed. All that on a big screen 7 days a week from 12h-24h. 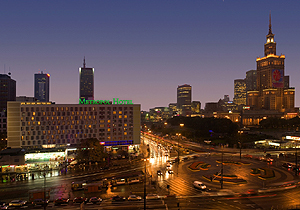 The Metropol Hotel is conveniently situated in the city center, opposite the Palace of Culture and Science and very close to all cultural, business, entertainment and shopping areas. The historical Old Town and the Royal Castle , as well as many other points of interest are also nearby. There is a parking lot in front of the hotel. The distance to the central railway station is 500 m . Distance to Airport: approx. 8 km / 20-30 minutes. Taxis from and to the airport are available on request. The public bus No 175 to the airport has a stop next to the hotel building. 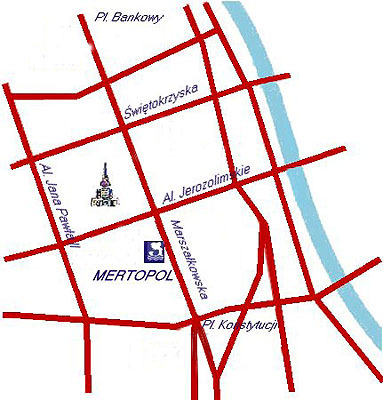 The next metro station is located just opposite the hotel.